Addis Ababa has halted a human rights resolution in the House by threatening to break off security cooperation with the United States. When Congressman Mike Coffman (R-CO) addressed a gathering of mostly Ethiopian-origin constituents in late September, he told them that according to the Ethiopian ambassador in Washington, Ethiopia would stop counterterrorism cooperation with the United States if Congress went ahead with a planned vote on a resolution calling for human rights protections and inclusive governance in the country (H. Res. 128). The threat appears to have worked: The floor vote on the resolution has been indefinitely postponed. This may be viewed as just another instance of an authoritarian government playing the counterterrorism card to avoid international criticism for a bad human rights record. But in the case of Ethiopia, it is more than that. H. Res. 128 has strong bipartisan support, with 71 cosponsors. The resolution passed the House Foreign Affairs Committee unanimously on July 27 and was scheduled for a vote by the full House on October 2. As the author of the measure, Congressman Chris Smith (R-NJ), said during the committee mark-up, the resolution is like a mirror held up to the government of Ethiopia, and it is intended to encourage them to recognize how others see them and move forward with reforms. While the resolution contains provisions that call for sanctions—under the Global Magnitsky Act—against Ethiopian officials responsible for committing gross human rights violations, the more important reason why the government took the severe step of threatening the U.S. Congress is the damage that this resolution could do to the country’s image. Over the past decade, the government of Ethiopia has carefully crafted its reputation as a development success story, a champion of peace, and a bastion of stability in the troubled Horn of Africa region. In response, international donors have poured in billions of dollars in aid, amounting to roughly 50 to 60 percent of the national budget. 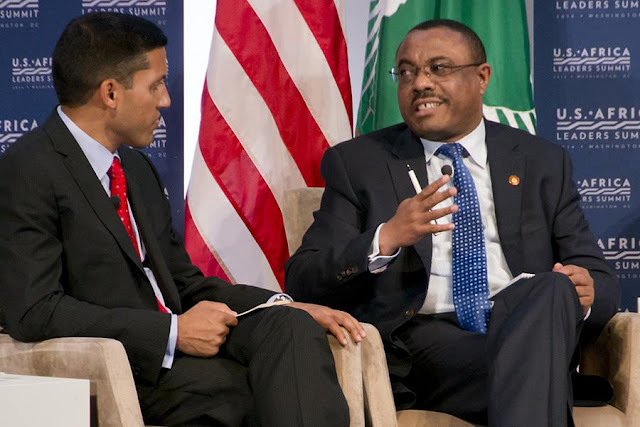 The United States maintains a significant geostrategic interest in Ethiopia and considers it a key partner for counterterrorism and international peacekeeping. The country is consequently one of the largest recipients of U.S. aid in sub-Saharan Africa. In addition, Ethiopia is a current member of the UN Security Council and the UN Human Rights Council. For the government in Addis Ababa, all this international recognition is not only about looking good and important in the eyes of the international community. It is also a powerful propaganda tool that has been diligently exploited to boost the regime’s increasingly shaky legitimacy at home. However, both resolutions were revived over the summer, and H. Res. 128 passed the House Foreign Affairs Committee with no opposition in July. Ethiopia’s threat to suspend security cooperation represents a last-ditch effort to prevent this resolution from advancing any further. Ethiopia’s latest bout of unrest and state repression began when a government development plan for the capital region triggered protests in the surrounding Oromia region, whose residents faced displacement under the plan. The demonstrations continued even after the scheme was rescinded, driven by deep frustration with decades of ethnic exclusion under the authoritarian regime. The ruling party’s formal diversity masks the ethnic Tigrayan elite’s de facto dominance of all aspects of public life, and the protests have drawn much of their support from the sidelined Oromo and Amhara populations—which together form a majority in the country. Over 1,000 people have died at the hands of security forces since the antigovernment protests erupted in Oromia in November 2015. Some 25,000 people were detained in makeshift prisons and military camps under a state of emergency that was declared in October 2016 to stifle the protests. When the government lifted the state of emergency in August, there were still over 7,000 people in custody and facing criminal charges. The government rejected repeated calls from the international community for an independent investigation and accountability, claiming that it has systems in place to investigate and punish any abuses. However, the country’s judiciary enjoys no independence from the executive, and to date there is no evidence that any member of the security forces has been brought to justice. Indeed, the police’s standard response to protesters continues to be indiscriminate firing of live ammunition and mass incarceration. Diplomacy alone has so far failed to change the behavior of the Ethiopian government and to stop its relentless attacks on human rights and prodemocracy activists. H. Res. 128 is important and necessary not just as a response to Ethiopia’s heavy-handed tactics against largely peaceful demonstrators, but also as an incentive for the government to open up civic space and promote inclusive governance. With antigovernment protests increasingly taking a violent turn in recent months, a strong and unequivocal signal from the United States demanding accountability and concrete reforms is required to avert an all-out crisis and to create a path toward sustainable regional stability. Counterterrorism partnership should not give Ethiopian authorities a pass to continue killing and jailing political opponents with absolute impunity, and Ethiopia may not be of much value as a security partner going forward if the bond between state and society is allowed to disintegrate in this manner. Passing H. Res. 128 would send a powerful message to Addis Ababa to get serious about undertaking reforms, and the Ethiopian government’s bullying tactics should not derail it. Members of Congress should call the bluff, place the resolution back on the House agenda, and approve it. Experience shows that Ethiopia would never follow through on the threat to halt security cooperation. The government fully understands who would be the ultimate loser if it did.